Excess crankcase pressure is vented from the crankcase through the PCV system, where it is drawn into the intake manifold and returned by the engine. This recirculated air contains aerated oil from the crankcase which is burned by the engine. Turbo charged engines often draw significant amounts of oil into the engine through the PCV system. This oil catch tank system removes aerated oil so that it can be drained and recycled. 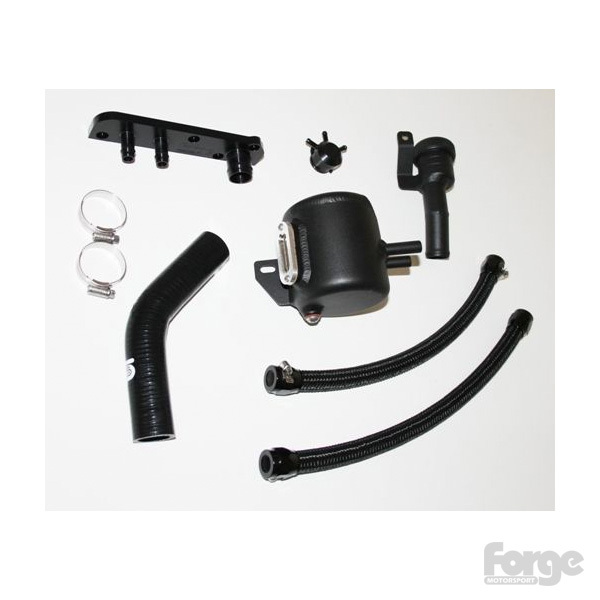 This kit is suitable for intallation to the 2 litre FSi engines found in the VW MK5 Golf , MK5 Golf Edition 30 and SEAT Leon Cupra ( not for engine codes CCTA CBFA ) The kit is available in two versions, as in different geographic locations these vehicles are fitted with a charcoal filter, located at the front of the engine bay ( on the left as you open the bonnet / hood ). If you have this carbon filter fitted then this product will fit your vehicle. If you do not have a charcoal filter you will require our alternative kit FMMK5CT We spent significant amounts of time on every last detail of this kit, incorporating everything necessary to completely bypass the stock PCV system while actually providing increased operative function. The kit is recirculating in design so as to maintain emissions compliance, however, it will capture all of the aerated oil, fuel, and water vapor contained in the blow-by gasses that would otherwise enter the intake tract and potentially contribute to deposits on the intake valves, thereby keeping the intake system clean and the engine performing optimally long-term. The kit incorporates features such as: - Hand-fabricated aluminum tank - Maintenance free baffle design - CNC machined billet aluminum PCV bypass plate - Large 30 fl. oz. tank capacity - Universal tank mounting bracket - Stainless mounting steel hardware - Clip-on intake manifold cap with 3 vacuum / boost references - Will work with stock engine cover/airbox - Black powder coated tank and bracket - Hard anodized plate and manifold cap - Sight glass to check tank fluid level - Drain plug and crush washer - Oil resistant flourosilicone lined hoses - Stainless Steel hose clamps - Optional Forge logo sticker - Will work with aftermarket motor mounts - Should work with most if not all FSI-specific aftermarket intake systems The stock PCV assembly incorporates a system of check valves that can effectively cause a boost leak of pressure back into the crankcase when they fail. This assembly also deposits the water, fuel, and oil vapors back into the intake manifold leading directly to valve deposits that can inhibit airflow and power over time. Our plate completely replaces this OEM assembly, bypassing the intake manifold entirely which will minimize intake valve deposits as well as eliminate the potential for a boost leak the wrong way through the system. The plate still incorporates the necessary provision for equalizing the crankcase pressure from the lower portion of the block with the valve cover, and it also features appropriately placed fittings for the venting of PCV gases to the tank. A unique feature included with the kit is a double-o-ring sealed clip-on intake manifold cap with three available ports to source a vacuum/boost reference for various engine accessories, such as a boost gauge, bypass valve, or a water/methanol injection trigger. Any unused ports can be plugged with the included grub screws.